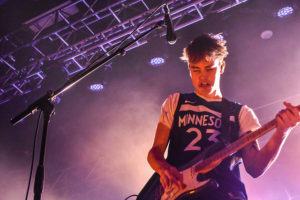 Indie-rock band Hippo Campus recently hit the stage in Phoenix for the band’s winter tour show at The Van Buren, bringing along the left-field pop band called Sure Sure, originally from Los Angeles. The band consists of band members Chris Beachy (keyboard/vocals), Charlie Glick (guitar/vocals), Kevin Farzad (percussion) and Michael Coleman (producer). Sure Sure filled The Van Buren’s space with joyful, hippie vibes with the fans swaying and grooving from the front row through the pit up to the balcony. The opener’s set was a variety with some songs slower and more indie and others faster and more alternative rock. The band members had a very personable stage presence that the crowd responded well to. Each song was accompanied with great lights. Sure Sure ended its set by having the crowd get a little dancy to the last song “Hands Up Head Down” before the fans returned back to their anxiously excited state of waiting for Hippo Campus. The crowd’s excitement burst forward when Hippo Campus took the stage, especially during “Suicide Saturday.” Hippo Campus set the bar for the energy in the room, and the crowd surpassed it. 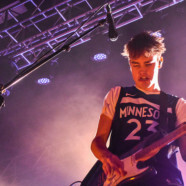 Hippo Campus is originally from St. Paul, Minnesota and consists of band members Jake Luppen (vocals/guitar), Nathan Stocker (guitar/vocals), Zach Sutton (bass) and Whistler Allen (percussion/vocals). DeCarlo Jackson joined the band for some extra instrumentals, including trumpet and tambourine. The band’s setup was visually pleasing, and the band uniquely kept to some similar light patterns that matched its indie tones. During the songs’ instrumental parts, the band members weren’t afraid to completely jam out and dive deeper into the performance and Hippo Campus’ indie vibes and intimate sounds made The Van Buren feel smaller and really filled the space well. Luppen’s high notes made the crowd swoon, and the band’s catchy tunes had the fans grooving and singing out the words. Any fan could tell what the crowd favorites were of the set when the energy levels tripled, and the room was suddenly brighter and more carefree. Hippo Campus hit home with the encore set with the crowd savoring every last moment, and then raving to each other after the show was finished. Phoenix can only thank them for a fantastic show and are patiently waiting for the return of Hippo Campus.